Denis Lynch (IRL) and RMF Echo were the final winners of a sensational weekend of top sport at the Longines Global Champions Tour of Madrid. The Irishman pulled out a Formula 1 fast jump-off round in front of passionate fans to take the COPA S.M. EL REY - Trofeo Volvo, beating Pieter Devos (BEL) with Apart and Cameron Hanley (IRL) with Eis Isaura in a ten rider showdown. The final class of the weekend, also known as ‘The King’s Cup’ is part of the long-standing tradition with this weekend marking the 108th edition of the show in Madrid. The final day’s action drew a bumper crowd, with passionate fans lining the arena to watch the competition unfold in the dusky afternoon sunlight. Santiago Varela Ullastres pulled out another cleverly designed course, using not only the flowing grass field’s gentle slopes but producing a mix of huge oxers with long distances contrasted with delicate verticals requiring shorter, collected strides. The water jump made another appearance, set in a calculated line and proved itself to be a true test for the riders to keep their rhythm. There was early heartache for the first rider to take centre stage, with plenty of thrills and spills to come. Michael Whitaker (GBR) with top horse Viking rode a careful clear, but stopped the clock just outside of the 75 seconds allowed, picking up a single time fault. Others were caught out by the tight time, including Marcus Ehning (GER) with Funky Fred, while some elected to retire knowing today would not be their day. First to go clear was Gerco Schroder (NED) with the 15 year old grey gelding Glock’s Cognac Champblanc, spectators on their feet in appreciation for their masterful round. They were quickly followed by Alberto Zorzi (ITA) and Danique, who squeezed in a foot-perfect clear just under the time allowed to create a jump-off. A man on a mission this weekend was Eduardo Alvarez Aznar (ESP) who brought out his other top horse, Fidux. Riding high on the crowd’s passion and enthusiasm for their home hero, he powered around the course to stop the clock fastest of all in 70.76s, well within the time and setting himself up as a strong contender for the jump-off. He would be joined by Niels Bruynseels (BEL) with Gancia de Muze, Evelina Tovek (SWE) with Mill's Sheridan, Jos Verlooy (BEL) with Igor, Laura Kraut (USA) with Whitney, Denis Lynch (IRL) with RMF Echo, Simon Delestre (FRA) with Sultan de Beaufour, Pieter Devos (BEL) with Apart, Henrik von Eckermann (SWE) with Flotte Deern and Cameron Hanley (IRL) with Eis Isaura. First to go in the jump-off, Gerco Schroder (NED) put in a steady clear with the slower moving Glock’s Cognac Champblanc to stop the clock at 43.47s, but knew he had a fast field behind him. Speed demon Alberto Zorzi (ITA) powered around the arena with bay mare Danique, another clear, and setting a new time to beat at 39.82s. The crowd erupted as Eduardo Alvarez Aznar and Fidux entered the arena for the final time this weekend. 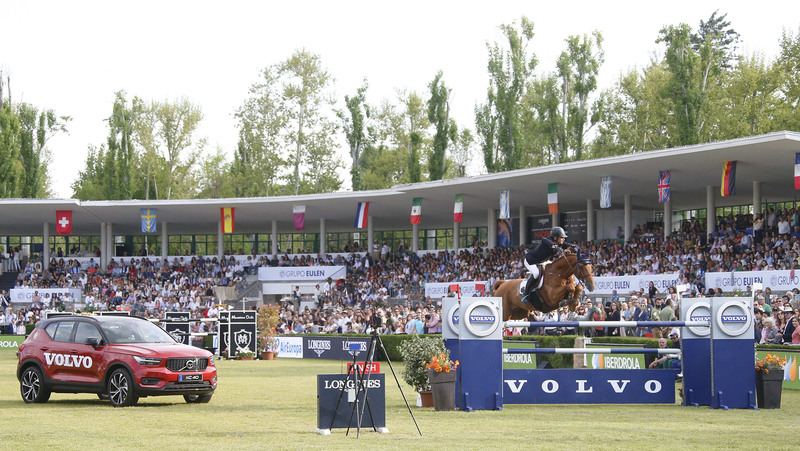 A brave turn back to a blue and red Madrid vertical, and then a dive inside the Longines fence to the final Volvo oxer before losing a stride to the last put them level with Zorzi, the crowd roaring as they galloped to the finish. But it wasn’t to be a home win, with the clock ticking down to 39.94s, just fractions behind the Italian. The pressure was on, and it was too much for Niels Bruynseels (BEL) with Gancia de Muze. They put in a brave try to be fastest of all - almost three seconds up - but had one down, ruling them out of contention. Young Swedish talent Evelina Tovek (SWE) followed suit, taking the inside line to the last fence but the angled distance cost them the front rail of the final Volvo oxer. Jos Verlooy (BEL) took a different route with his long-striding 9 year old Igor, galloping to the last but finishing clear just a touch slower to finish in 40.22s. Laura Kraut (USA) and the hot chestnut Whitney set off at a lightning fast pace, equal on time with Zorzi to the roll back Madrid vertical. But the mare anticipated the turn, tumbling the pole to the ground, and dropping them out of the order. Temperatures rose as Denis Lynch (IRL) pulled out all the stops with RMF Echo, another fiery chestnut who took up the challenge, galloping to the first fence in eager anticipation. A brilliant roll back, and a cut inside the Longines fence to the final put them up on time, with a perfectly timed stride to take over the lead in 37.37s. Three remained, with the crowd readying themselves for the final showdown. Pieter Devos (BEL) and Apart covered the ground effortlessly, slower initially, but picking up pace towards the end of the course to finish in 38.19s and into second place. Henrik von Eckermann (SWE) was deceptively quick, daring his 11 year old bay horse Flotte Deern to the fences and slipping just behind Devos in 39.68s. The final rider to go, Cameron Hanley (IRL) knew he had everything do with the 10 year old chestnut mare Eis Isaura to better his compatriot Lynch’s time. But it proved unbeatable, with Hanley stopping the clock in 38.70s, handing the win to his countryman. And so ends another spell-binding Spanish leg of the Championship race, with the Tour now looking to Hamburg, Germany, for the fifth leg on the 2018 season. For all the information, and scheduling, please click here.